Responsible Person: Guy Upward, Assistant Director of Fundraising. 47% of raffle proceeds in 2017 (after prize, draw administration, entry processing and promotional costs have been deducted), were passed to the society, The Royal British Legion. 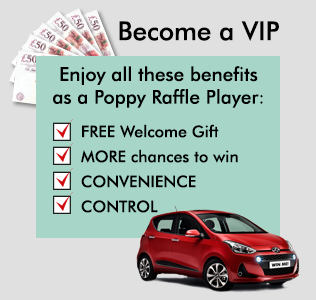 Purchase of entries to The Royal British Legion's Raffles must be from the Promoter, in accordance with the terms under which it promotes its lotteries. Entries will not be sold to or by any person in a street, unless sold from a kiosk or on the doorstep. Underage gambling is an offence and legally players must be aged 16 or over to enter lotteries or raffles. It is an offence for lottery entries to be sold to a person under 16. However the rules for subscriptions to The Royal British Legion's raffles requires new entrants since September 2016 to be over the age of 18. Any entrants found to be underage will forfeit the right to any prize and will have any monies paid in relation to the raffles returned to them. The Promoter reserves the right to use the data provided by entrants to verify against publicly available data sources that they are over the age of 18. Entrants must provide accurate entry information, including name, personal address and inform the Promoter of any changes to these details as soon as they arise. Residents of England, Scotland and Wales (Great Britain) are permitted to enter. Those residing outside Great Britain, in Northern Ireland, the Channel Islands, the Isle of Man and overseas, are not permitted to enter. Select employees of the Royal British Legion and those employed by their External Lottery Manager are not permitted to enter. Entrants agree to the Promoter's use of the information they provide in accordance with the current data protection regulations. The cost of each entry is £1. More than one entry may be purchased and payment must be made in advance of the draw date by one of the methods permitted, subject to the controls stated below. 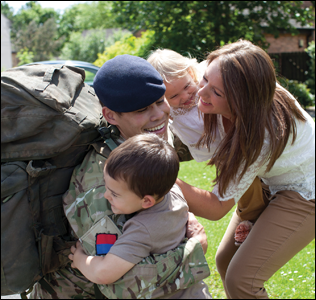 The Royal British Legion is committed to operating a socially responsible raffle and as such will need to verify with customers purchases of more than 50 entries at £50.00 per quarterly draw. Subscriptions on this website can be made by direct debit. To subscribe by continuous credit or debit card please go to www.poppyraffle.co.uk. Entries can be purchased online at www.britishlegion.org.uk or over the phone by calling the Raffle Helpline on 0800 954 0256 or by returning an application form to: Raffle Subscriptions, The Royal British Legion, PO Box 1127, Maidenhead SL6 3LN. The subscription is for 4 draws that the Promoter operates per year. The draws take place on a Friday (or on the next working day if this falls on a public holiday) in January, April, July and September. The dates of the draws each year will be confirmed in writing to participants and a payment schedule will be provided to entrants when they first subscribe. The draw will be conducted by computer operated random number generator. Entries from subscribers are automatically included in these 4 draws providing that payments have been successfully received. The prizes: £20,000, £5,000, £1,000, 2 x £500, 45 x £25, 200 x £10, 145 x £5. There are no alternatives to the prizes unless the Promoter states otherwise. Prize cheques are sent within 28 working days of a draw to the name and address of the registered owners of all the winning entries. Any prize cheques not banked by the recipient within 6 months of the date of issue will be cancelled and the value retained by the charity as a donation. No interest is payable on prizes and the Promoter is not responsible for any delay in bank payments. From time to time the volume and/or value of prizes may increase. No liability is accepted for loss, damage or disappointment in relation to non-cash prizes. Non-cash prizes may also vary slightly from the image/description shown. A list of the winning prize numbers with names and town/county of residence for the top 5 prizes is published on The Royal British Legion's website www.britishlegion.org.uk. A Winners list may be requested by post, by sending a stamped, self-addressed envelope to Raffle Subscriptions, The Royal British Legion, PO Box 1127, Maidenhead SL6 3LN or by emailing supportercare@britishlegion.org.uk. Entrants accept that they may be required to have their photograph taken should they win a prize for possible inclusion on our website and in marketing materials. The Promoter may (without giving any reason or notice) decline to accept an application, cancel an existing subscription, or terminate or suspend the raffle subscriptions scheme. Providing entrants have complied with the terms and conditions of the Draw, such cancellation will not affect their prior purchase of entries nor their rights as a holder of such entries. 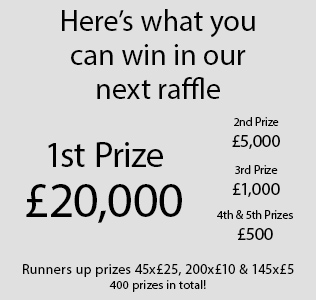 Raffle subscription payments will be held in a specific bank account and advance payments for future draws identified so that should the draw be cancelled, entrants may be refunded payments for those future draws. The Promoter's decisions made according to the Rules shall, once made, be final and binding. If you have an enquiry or a complaint about The Royal British Legion's Raffles, please call the Supporter Services on 0333 011 4500 or email supportercare@britishlegion.org.uk A Complaints and Disputes Procedure is available on the Legion's website or can be provided by post on request.